Our flight to NY arrived at Newark airport at 2am so we opted for an airport hotel so we could get a decent night’s sleep before heading to Manhattan in the morning. Faced with a journey of a couple of hours to our accommodation, we needed some fuel for the journey so opted for breakfast at the airport hotel. I figured we should be able to find something to eat on a buffet, but the pickings were pretty slim. After some eye rolling from the waiter at our query about soy milk, we ended up with dry toast, peanut butter with banana and black coffee. There was also some oatmeal without milk in it. None of it great, and expensive at $36 for the two of us, with barely civil service and a handily added (not) compulsory 18% tip. After arriving in Manhattan we walked to Two Boots for some delicious vegan pizza topped with daiya cheese, artichokes, pesto and a red pepper sauce. 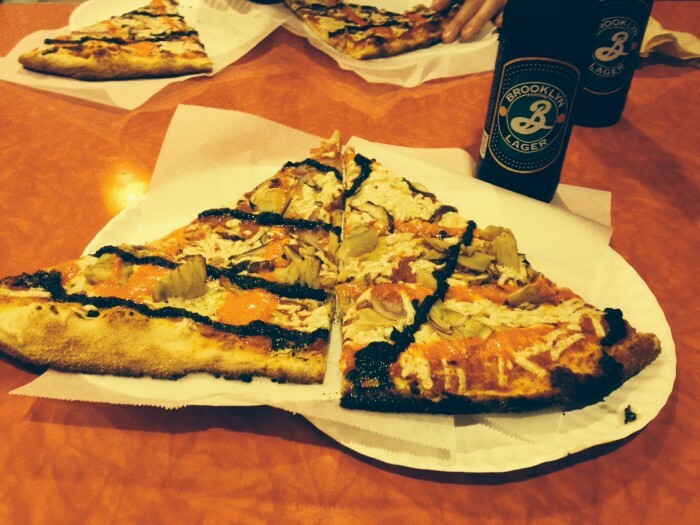 New York really does do excellent pizza. That evening we headed to Caravan of Dreams. Not my favourite spot, with ok, but uninspired food that you could easily cook at home. It was made worse by being relatively expensive, compounded by the addition of an in house pianist playing maniacally. The next day was action packed, with a visit to MOMA, the Guggenheim to see some early Kandinsky works and an exhibit about Frank Lloyd Wright. 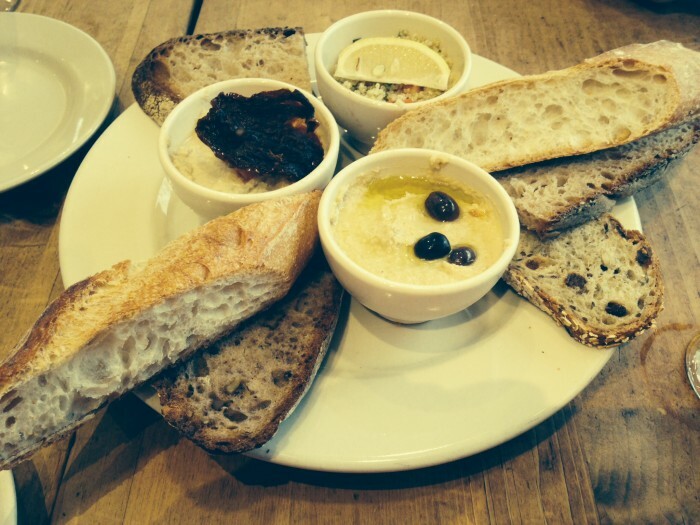 We grabbed a snack of dips and bread at Le pain quotidien, a small chain sourdough bakery that has some good marked vegan options on their menu. I’m always pretty happy when I find vegan food in mainstream cafés and restaurants. Their bread is top notch. Afterwards we went to see the Book of Mormon. It was pretty hilarious, if occasionally overstepping the mark into puerility. I still have a couple of the songs running in my head. On the way home we grabbed a late night Brooklyn lager and pizza from Two Boots again!